I've always loved Peanut Brittle. For me, Peanut Brittle is a tie to the past; an old fashioned candy that appeared in our house only during the Christmas season. I remember how it came in a small cardboard box wrapped in cellophane that I couldn't wait to open. I think the appeal of Peanut Brittle is how its shiny and hard surface belies how easily the sugary brittle dissolves on the tongue, leaving behind delicious chunks of toasted peanuts to chew on and savor. Peanut Brittle has a sweet and buttery flavor with a hard and crunchy texture. It uses the most basic of ingredients (sugar, corn syrup, and peanuts). What's important to know is that the corn syrup controls the grain of the brittle so adding too little and you have a grainy textured brittle, while adding too much will result in a stringy and sticky brittle. To start this Peanut Brittle, the water, corn syrup, sugar, raw peanuts, and salt are brought to a boil. Because the peanuts are raw they are added at the beginning so they have time to cook and impart a nice peanut flavor to the sugar mixture. Some recipes call for adding roasted peanuts and if you want to do this, simply add the peanuts, not at the beginning, but rather when the syrup reaches about 245 degrees F (118 degrees C). Brittles are cooked to a very high temperature, the 'hard crack' stage (296 degrees F, 147 degrees C). You will need to stir the sugar mixture occasionally to prevent the peanuts from sticking to the bottom of the pan, and thereby scorching. When the brittle reaches the desired temperature, remove from heat, and carefully add the baking soda, vanilla extract, and butter. The brittle will immediately puff up but just keep stirring until everything is mixed together. Baking soda is added as it helps with browning plus it gives the brittle a lighter and crunchier texture. Butter and vanilla are added for flavor. The brittle is then poured onto a cookie sheet and if you want a thin brittle, then while the brittle is still very hot, use two forks to stretch the brittle to how thin you want it. 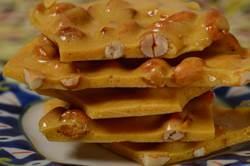 Peanut Brittle: Lightly butter a large baking sheet. Have ready the baking soda, vanilla extract, and butter. Set aside. Remove from heat and immediately stir in the baking soda, vanilla extract, and butter (the brittle will puff up) stirring until everything is mixed together (about 30 seconds). Immediately pour the brittle onto your baking sheet. If you want a thin brittle, then while the brittle is still very hot, use two forks to stretch the brittle. Do this by gently pulling the brittle, working your way around the entire mass. Let the brittle completely cool and then break into pieces. Store in an airtight container or a plastic freezer bag as this will prevent the brittle from becoming sticky and breaking down. Store at room temperature or in the refrigerator for up to two weeks. This recipe can be doubled. Makes about 1 pound (450 grams). Preparation time 30 minutes.